And now a new adventure has Banderas Bay bouncing! 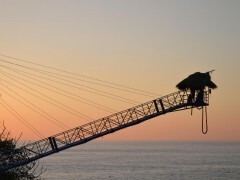 Encore Bungee has opened a bungee jump in Mismaloya, just 15 minutes south of Puerto Vallarta, the only bungee jump in the region, as phase 1 of the upcoming Encore Bungee and Adventure Park. Future plans for the park include a floating bar, restaurant, air-line scuba diving, snorkelling and a climbing and rappelling wall, to make a trip to Encore a full-day adventure. 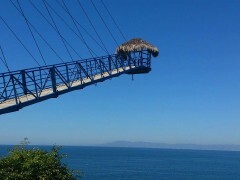 The bungee jump bridge juts out over the waters of Banderas Bay, some 40 meters below, and offers stunning views of the Pacific Ocean and bay. But few have time to properly admire the view as their adrenaline gets pumping in anticipation of their scream-filled bungee jump. Encore Bungeehas purchased state of the art equipment including a custom-made bungee cord imported from Canada and has brought staff to Puerto Vallarta from other parts of Mexico who are extensively trained and experienced in bungee jumping. And their ONE-TWO-FREE promotion has already brought loads of adrenaline junkies to the tour, taking their first jump for 650 pesos, their second for 400 pesos and their third for free. Outdoor adventurists and thrill seekers love Puerto Vallarta and Riviera Nayarit because of the wealth of different nature and extremetours available in the region. 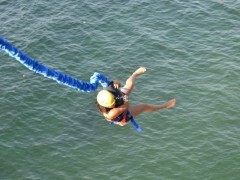 Talk to your Luxury Beach Concierge for more details about getting airborne at Encore Bungee or other extreme adventure tours in Puerto Vallarta and Riviera Nayarit.